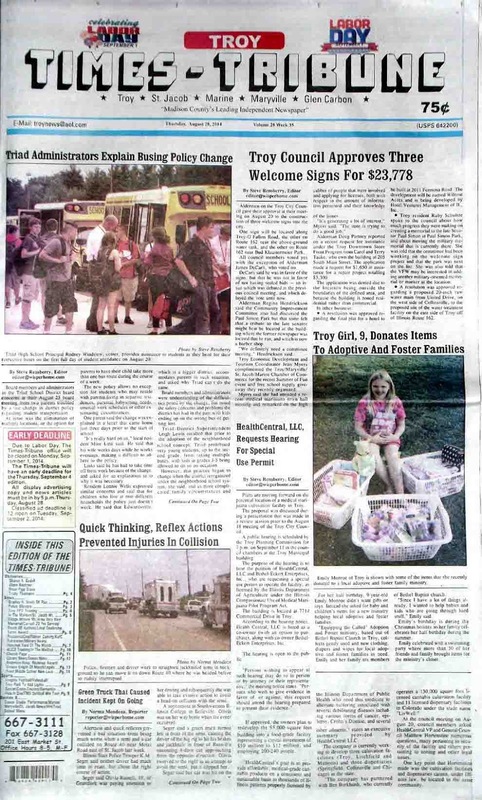 The August 28, 2014 issue of the Troy Times-Tribune is now available. Some of the headlines in this issue: Troy Council Approves Three Welcome Signs, Triad Administrators Explain Busing Policy Change, Quick Think Prevents Injuries in Crash, HealthCentral Requests Special Use Permit for Proposed Medical Marijuana Plant, St. Jacob Board OKs Caterpillar Mini Excavator and Skid Steer, Troy Fire Department Trains With Surrounding Departments, Marine Notified of Bond Madison Water Company Rate Increase, Area Veterans Fly to Washington. D.C. to Visit Memorials, Triad Knights Look to Rebound from Down Years; plus we have plenty of police blotter news, a column about heat dangers and emergency shelters, a full page photo spread about the building changes at Triad Middle School, plus lots more news and photos of area happenings. We have obituary listings for Sharon A. Godell, Glenn Noeltner, Brian Pigg Stone, and Trudy Thalmann.